2 What I need before start? The main goal of this page is instruct how to install the latest PascalSCADA snapshot on the latest Lazarus version. Why I don’t explains how install it on Delphi or on a outdated Lazarus version, is question to another page, or feel free to send the instructions to install it on the desired IDE. So, if you dislike some of these packages, feel free to create a new package without the undesired package. BIG Warning 2: The PascalSCADA isn’t like others SCADA systems. 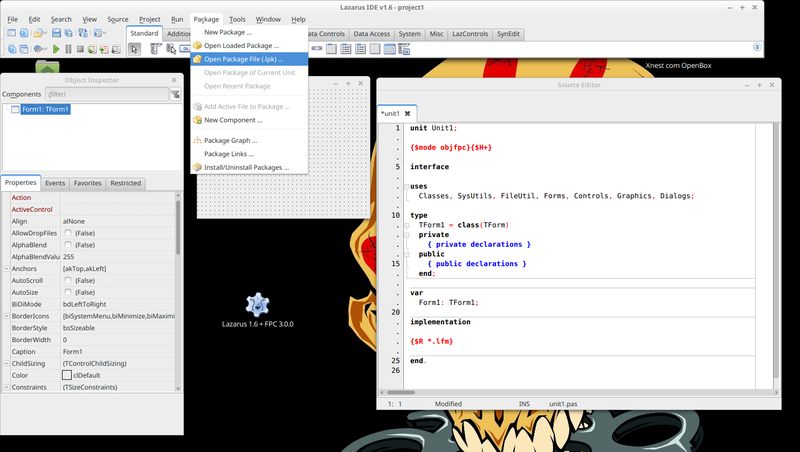 It’s a package, plugin or a add-on (you name it) for Lazarus to enable it to create HMI/SCADA applications. So, a wizard with Next, Next then finish buttons will be not available. What I need before start? Latest Lazarus version. 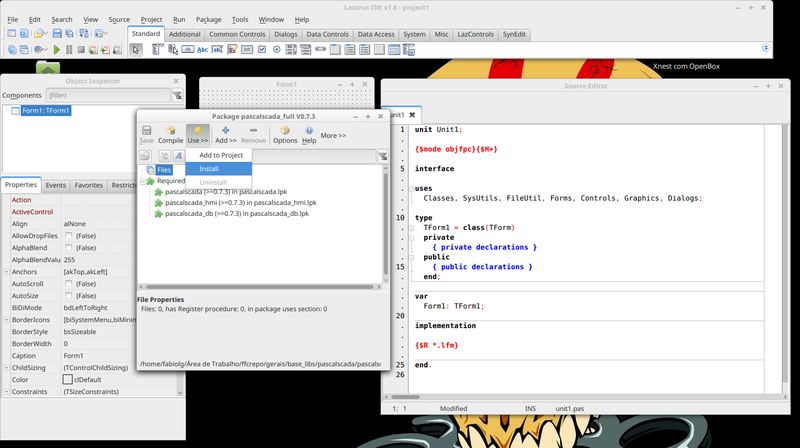 If you are a Windows user, you can get Lazarus from: http://www.lazarus-ide.org/. If you are a Linux/FreeBSD user, you can get it from your package system. Latest PascalSCADA: available on this link. WinRAR or something else that can decompress .bz2 files. If you see your fresh Lazarus similar to this, you are on the right way. 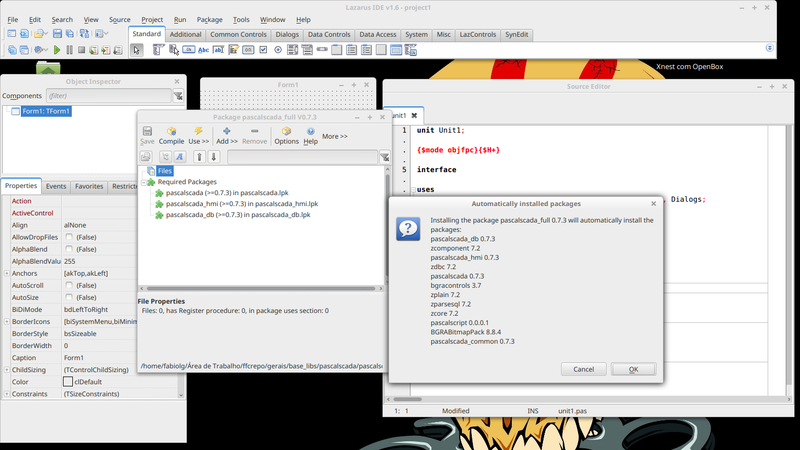 The next step is install the PascalSCADA package. Please forget the Lazarus by a moment. 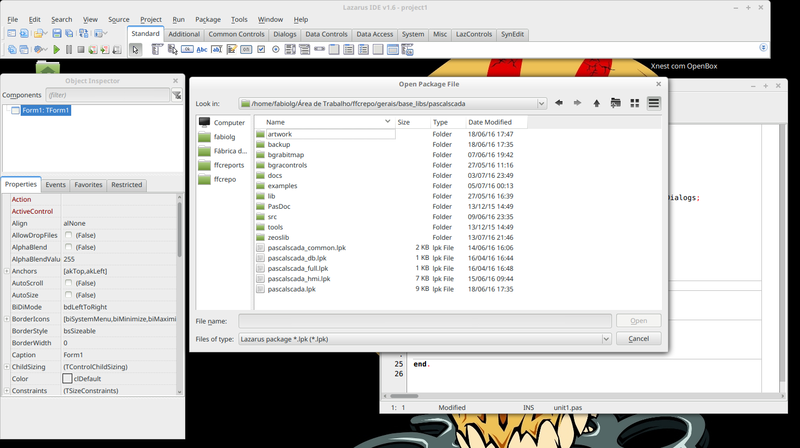 Go to your Downloads folder and find the downloaded PascalSCADA and extract it to a folder of your choice. The last step, is install it into your IDE. To do this, click on button “Use >>” then select install. To continue, click on “Yes”. The installation process will be started and your IDE will be recompiled. At the end of recompile process, the IDE will restarted. If you have a project with unsaved changes, take care!! 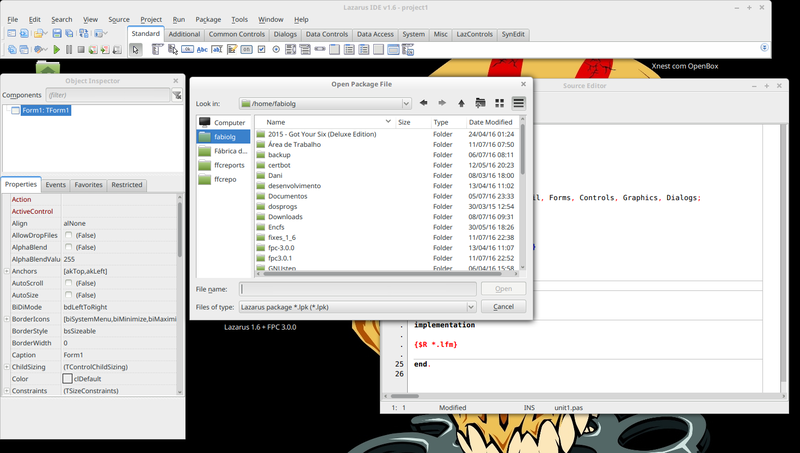 If you see these tabs, congrats, you successfully installed the PascalSCADA on your Lazarus IDE. How to install Pascal SCADA Latest version in Code Thypon to update Component. And how to install in Delphi RAD Studio Berlin ? ** on pascalscada_hmi_package, replace the BGRABitmap and BGRAControls by pl_BGRABitmap and pl_BGRAControls. On Delphi RAD Studio Berlin? I don’t know, since I don’t update the packages for Delphi since Delphi XE2. Can you try and explain to us? 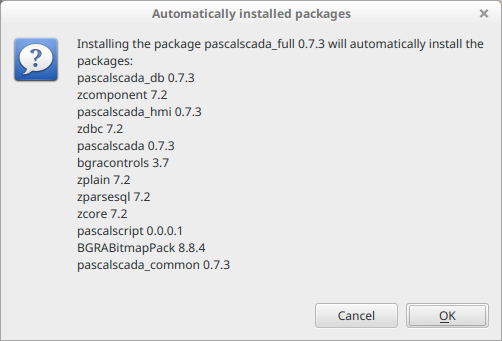 Is it possible to install PascalScada on Mac OS X ? I did no tested PascalSCADA for Mac OS X, but it have no reasons to don’t work. Maybe we can test together? What’s your Mac OS X? I set a virtual machine to test PascalSCADA on Mac OS X El captain. I found some issues related with constants and units that are not defined/available for Mac. I’m fixing theses issues. When it’s done I’ll notify you. 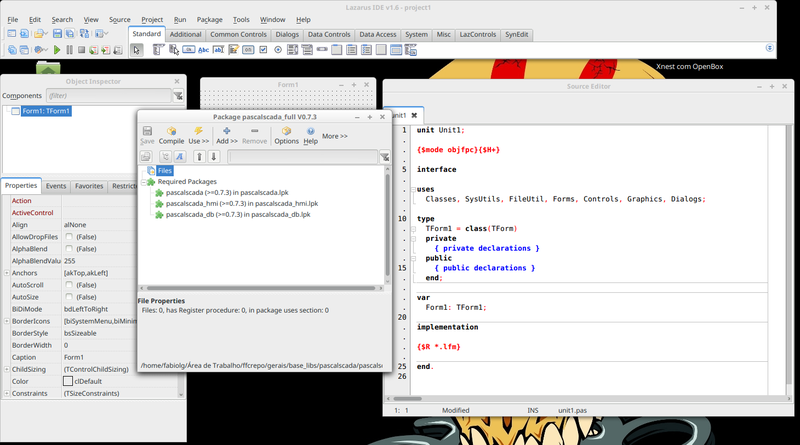 3Picure: I finished the changes for Mac OS X today. Can you download the latest revision from SVN and test? I download today and summary test! Its possible set digital input bit using pascalscada? Yes and No. I need to known your architecture to answer your question. Please tell-me, whats your PLC? What’s the source of your PascalSCADA? Download? SVN? Test and report things that goes wrong. I think that this is caused because I used development versions of BGRABitmap and BGRAControls. Now I use stable versions of these libs. I’ll publish a new snapshot today. I did some tests with Lazarus 1.6.0 + FPC 3.0.0 Win32 and everything appears to be OK.
Do you have any tutorial/manual on how to do alarming with this packages? I would really like to see how this is done with modbus tcp. This should be done via source code because alarming is missing feature in PascalSCADA yet, because I’m not a skilled developer across multiple databases. So, write these components is a big problem to me. But in my applications, I use a TPLCBlock to read all alarms together. The write on database occurs on event OnValueChange. On this event handler I declare a array of strings, where each array element represents the message of each alarm of TPLCBLock. Each active alarm receive a identifier, on this case it’s the auto increment key of the alarms database table and it’s stored on the application during all the life of this alarm. When a alarm is finished, I use this alarm identifier to finish it on database. After finish it on database, the value 0 (zero) is assigned to the variable that stores the alarm identifier on application. I’ll write a example showing how implement this. I really like PascalScada, you have done a great job. I finished a small example of how implement a simple alarming system. I managed to change it to modbus tcp and mysql. Now i need to figure out how to implement an acknowledge to the PLC. Keeping the alarm in the alarm list until it is acknowledged and normal status. But how can I at the same time update the ack column for the alarm in the database send an acknowledge value to a certain holding register (same index as alarm but in a higher range) in the PLC by selecting one alarm from the DBGrid and pressing an ACK button? What are the limitations on TPLCBlock? How many arrays can I have in one TPLCBlock? 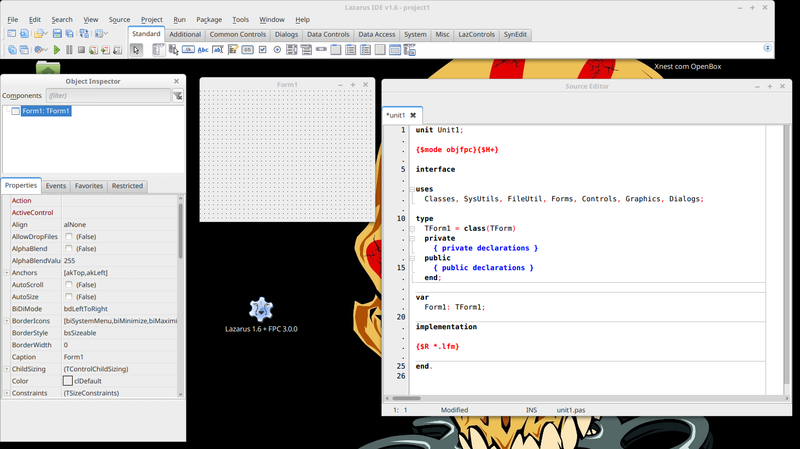 And how many TPLCBlocks can i have in my project before it gets to slow or crashes? I need any example how I should configure components TCP_UDPPort, ISOTCPDriver, TagBit to work with S7 1200. Maybe small example, or step by step configuration..?